Photo: Dinner at Mukune-tei, the restaurant at Daimon shuzo (sake brewery) in Osaka. January 2008: I’m at the John Gauntner Sake Seminar, it’s the last dinner of the week. We’re upstairs in the restaurant in the impossibly gorgeous old farmhouse and Daimon-san is giving a lecture about sake. I’m trying to focus, but the junmai daiginjo is making the table glow and I get distracted by the crispy coating on the little pink and white fried taro balls. I ask the waitress and she tells me, “mijinko.” I write it down on the menu and put it aside. I figure I’ll look it up later. I do, and I can’t find anything about it. Photo: Fried stuffed lotus root with “Japanese rice crispie” coating at Sushi Taro, Washington, D.C.
November 2009: I’m in Washington, D.C. at Sushi Taro, and the waitress brings course 8 of 10, fried lotus root that has been stuffed with kamaboko (fishcake) and she says, offhandedly, “Coated with Japanese rice crispies.” Ah, mijinko! Hi, I’ve really enjoyed looking through your blog after stumbling upon it a few weeks ago when I absentmindedly googled the phrase “I miss good Japanese food” (or something like that). 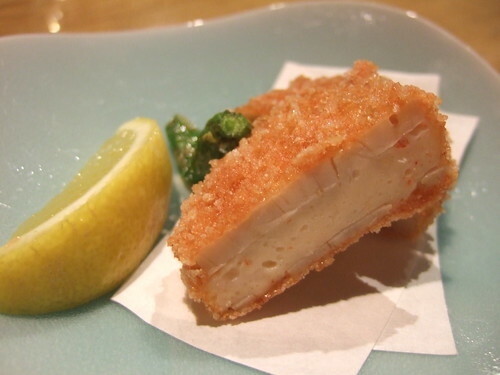 It seems that you may in fact be able to get the crispy texture you describe if you fry something with mijinko flour– try doing an image search for微塵粉揚げ. Also, you may have already come across this information when doing your own research, but apparently the flour is made by steaming mochi rice, rolling it into a shape similar to rice crackers, and then letting it dry before grinding it into a fine powder. Sounds like an experiment is in order! Madam says: This is what is bothering me. 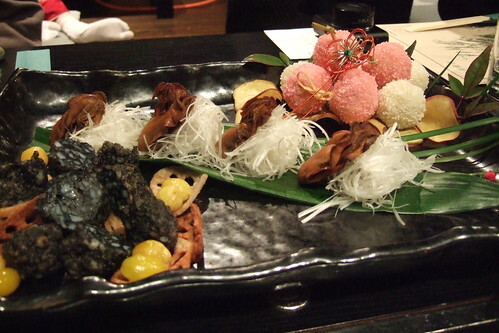 Those images have crispy coatings, but not quite the rice crispie effect that I had at the dinner in Osaka (the pink taro balls). Experiments are in order indeed. It is also called Shinbikiko, I believe. I know you can get a big bag at a shop in Tsukiji jogai. Let me know if you need any! Madam says: I knew you’d know! Still, I’m wondering about the perfect rice crispie exterior. I wonder if I can find it in the DC area.